Home Auto Insurance Guides Do You Really Need Snow Tires? The holiday season is fast approaching and that means a few things. Not least of which: Winter is coming. Although Winter doesn’t officially begin until nearly Christmas Day, the traditional Winter weather can start weeks before. Snow Tires or Regular Tires? One of the most popular questions we see around preparing your car for Winter is: Should I get Winter tires? Think of it as like wearing your summer flip-flops instead of duck boots; you’re asking for trouble. Year-round tires are typically pretty bare, offering little traction in snowy conditions and on icy roads. Snow tires have deep, open tread patterns that allow them to firmly grip the ground below. They are also designed to remain flexible and supple in the coldest of temperatures, which helps on slick ice. Installing snow tires on your car is the best way to keep you and your passengers safe this winter. 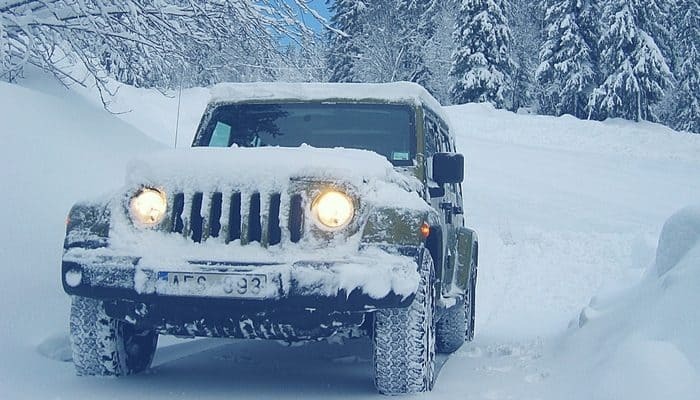 For those who live and drive in particularly snowy, mountainous areas (ahem, Montana) studded tires are recommended to help plow through hard-packed snow. Additionally, the Department of Motor Vehicles advised that if changing to snow tires, you should change all four. Changing just the front or back tires will only create issues with your vehicle. I checked out Goodyear’s website and researched the price of Winter vs Summer tires for a 2016 Chevrolet Impala. The cheapest Summer tire would set you back about $150 and the cheapest Winter tire is about $200. A $50 difference per tire isn’t too bad, especially for the additional grip and peace of mind that you’ll get with a Winter set. Around this time of year, there are also often deals on buy 3 get 1 free or cashback incentives, so it can end up working out even cheaper. Can I Use My Winter Tires All Year? Swapping out a set of tires twice year sounds like a pain, right? We often get asked if you can just keep the same tires on all year and do away with switching in and out. Unfortunately, it may cost you more money in the long run to try and cut labor costs. Winter tires are designed to withstand freezing temperatures and grip on tough terrain. That means, when they’re faced with hot roads and sharp turns, they just don’t perform to the same standard as their Summer counterparts. At best, it can cut the performance on your sports car, at worst you could blow a tire in the middle of the highway. What Do I Do With My Winter Tires in the Summer? Easy: swap them out! Getting Winter tires taken off and Summer tires put on is a relatively inexpensive procedure. ThoughtCo. reports that mounting and balancing a set of four tires should cost around $14 – 43 for the set. Since you’ll only be using your tires for a couple of months, you should be able to re-use them for a couple of Winters before needing a new set. Just store them in your garage for the following year. That said, with the extra wear and tear of driving in the snow and all the debris that gets frozen into it, Winter tires may wear faster than Summer tires. Check your tires regularly, I recommend once every two weeks at least. An easy way to check if they’re legal is to use a one cent coin. If you can see all of Lincoln’s head, then they’re too worn. Time for a new set. Winter weather can often be unpredictable and when a storm does hit, it has the capability of quickly turning strong and violent. During the cold, snowy season it’s important to have an emergency car kit in your vehicle at all times. Just because the road is slick with ice, it doesn’t stop you hitting a nail or stone and getting a flat tire. There’s no point in having a shiny new pair of Winter tires if you keep a below-par Summer tire as your spare. Having an effective spare tire is one of the most important things to have in your car.